Our Programs page and our event calendar has been updated. The site could not be updated for more than a week due to broadband connectivity issues. All contents that could not be posted will be there as soon as possible. During the memorial event for Late Prof Badal Das, Denner Milan Basu’s younger daughter Sayani Basu gave her first public performance on Sitar recital. This is the recital’s video. All are encouraged to watch it and comment on her performance. Prof Badal Das was a Sitarist of yesteryear. He was trained under the famous Surbahar and Sitar maestro Pandit Laxman Bhattacharya. As a true artist and creative person, he was not only an accomplished Sitar player but was also proficient in painting, playing flute and singing Kali Kirtan and has passed on his legacy to a number of disciples and students he has left behind. He was also an excellent cook and not many people know that he used to spend a lot of time in kitchen experimenting with different recipes. He was well known as a very kind hearted man and despite being a multifaceted talent, he had shunned popularity all his life and was very averse to self promotions. He was also very fond of Pandit Nikhil Banerjee, while at the same time Pandit Nikhil Banerjee was also an admirer of Prof. Das’s music. It was a relation of elder and younger brothers between them. Between the period 1970 to 1985, Prof Das was a regular performer in a number of classical music concerts. The last time he performed publicly was at Surya Sen Manch in Calcutta in the year 2003 for the “All India Music Festival”, where he played a brilliant raaga Bhimpalasi, accompanied by today’s famous Tabla player Sri Biplab Bhattacharya. 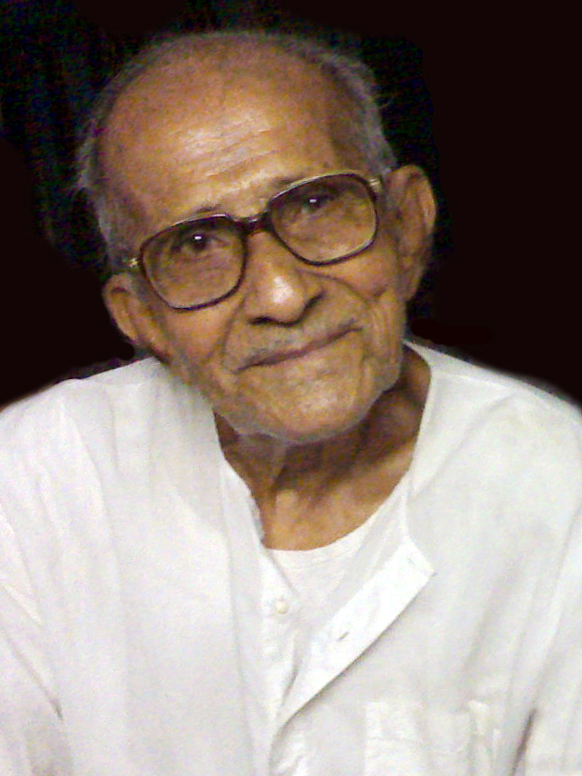 He left for his heavenly abode at a ripe age of 93 years on 16th August 2012. May his soul rest in peace. Here is the photo album for the event if you are interested. Upcoming programs of Dakshinee Sangeet Sammilanee to be held in January 2013 have been posted on the Programs page and updated in our even calendar. When you visit the Programs page from today onwards, the first thing you’ll notice is the our new event calendar, which was introduced today. It will help us to have a structured view of the events that would take place or have taken place during the current month. You can easily navigate to previous or coming months too by pressing the two arrows (left/right) on the top of the calendar. A single click on any of the events on the calendar will pop-up the event details. This calendar is also supposed to send automatic reminder emails to all the members a day before the event occurs – so let me know if you are not receiving them. You’ll also find our past text based program schedule being maintained below the calendar – but as maintaining both of them is a tedious job and involves duplication of work, the plan is to keep only one of them based on your feedback. So please take a moment and let me know which one you would prefer. The schedule for the ITC SRA Sangeet Sammelan (6th – 9th December 2012) has been updated on the Programs page. An Archives page was added to our site today to help the visitors browse through all our past posts in an easy manner. Sri Sameehan Kashalkar, son of Sri Ulhas Kashalkar, will perform at the ITC SRA auditorium on Wednesday, 21st November 2012 from 7 pm onwards. He will be accompanied by Sri Biplab Bhattacharya on tabla, Smt Rupashree Bhattacharya on harmonium and Sri Sarwar Hussain on sarangi. Our Programs page has been updated with this information.